Apple has posted a series of job listings today and earlier in May for retail positions in Brooklyn, confirming that the company plans to open its first store in New York City's most populous borough in the near future. Apple's jobs website lists typical retail store positions, including Creatives, Experts, Geniuses, Specialists, Business Leaders, and management, while recent LinkedIn postings seek a Retail Manager and Senior Manager specifically in Brooklyn. Brooklyn's population is estimated to be over 2.6 million, which as a city would be the fourth largest in the U.S. behind the rest of New York, Los Angeles, and Chicago, yet there remains no official Apple Store in the borough. Rumors point towards Apple opening a retail store in the Williamsburg neighborhood of Brooklyn in the second half of 2016. 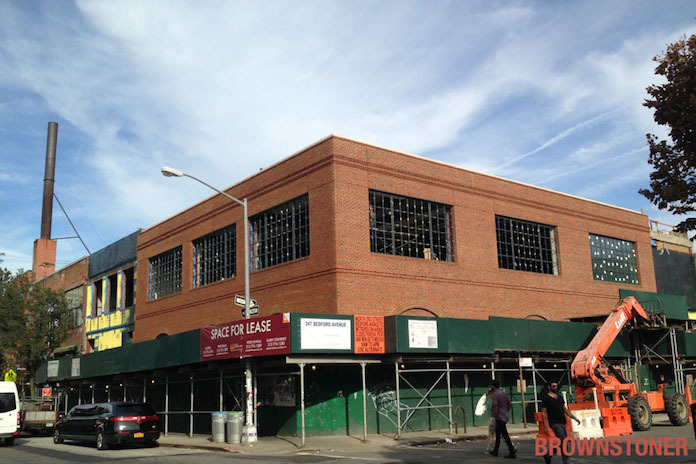 Apple reportedly signed a long-term lease for a 20,000-square-foot space at 247 Bedford Avenue, at the corner of North 3rd Street, and construction has been ongoing since 2015. Apple has opened six retail stores in the neighboring borough of Manhattan, including Fifth Avenue, Grand Central, SoHo, Upper East Side, Upper West Side, and West 14th Street locations, alongside one store in both Queens and Staten Island. Apple is also expected to open a retail store inside the Westfield shopping complex at the World Trade Center in Lower Manhattan later this year. Today marks the 15th anniversary of the grand openings of Apple's first two retail stores in Tysons Corner, Virginia and Glendale, California, and the company marked the occasion by inviting media for a preview of its new flagship Union Square location opening in downtown San Francisco on Saturday. Apple retail chief Angela Ahrendts outlined all of the new features of that store, some of which will be adopted at other locations worldwide. - The Avenue: Interactive themed “windows” showcasing Apple products and services, alongside a curated selection of “Only at Apple” third-party accessories. New “Creative Pros” will be available to offer “advice and expertise” about each of the displays. - Genius Grove: A section at the center of the store designated for customers to receive support side-by-side with Geniuses under the canopy of local trees. This area is able to accommodate more customers than a traditional Genius Bar commonly found in other stores. - The Forum: Apple describes this area as a “vibrant gathering place” next to the large 6K Video Wall, where “Today at Apple” sessions and other daily and monthly events will be hosted related to education, creative arts, music, games, and more. - The Plaza: Apple has connected its Union Square store with the surrounding community with The Plaza, an outdoor area open 24/7 and featuring a 50-foot green wall, public Wi-Fi, seating for 200 people, and a fountain created by sculpture artists Ruth Asawa. Apple says the space will feature live acoustic performances. - The Boardroom: A room with tables and chairs at the back of the store where Apple’s Business Team can offer hands-on advice and training to entrepreneurs, developers, and other small and medium business customers. Keep track of Apple's retail store developments by reading our Apple Stores roundup. Actually baffled why they never had a store in Brooklyn for so long. My dad would always have to go to the SoHo store for help. Not enough hipsters lived there in the past, but now the place is riddled with them. "Not enough hipsters lived there in the past, but now the place is infested with them." hipster money doesn't support Whole Foods and Apple stores. the place is now infested with condos and jocks. By "now" you mean the last 25 years, right? The "Genius Grove" thing is kind of bizarre, but I actually like it. What Apple Stores could really use is "fast lane" no appointment needed Genius service for quick things like in-warranty cable replacements. It's kind of annoying to have to sign up for an appointment, then wait, for something that takes a minute. Inefficient use of the Geniuses time too. Whatever employees that is doing nothing but checking people in to the Genius Bar could handle those transactions. Even better -- before arriving use the Apple Store app to indicate which cable needs swapping out and the store will text you when it's ready for p/u. Then the employee only needs to verify the warranty and that the cable is bad and you are out. They would have been better off opening one in Downtown Brooklyn. A lot more trains go through there and it would have been easier access for most of Brooklyn. I don't know; I grew up in Brooklyn, and once you went to the trouble of getting on the subway, you might as well go all the way into the City. Apple should maybe start focusing more on their products a little more as Chromebook just passed Macs for sales last quarter. Its pretty sad when a severely functionality crippled glorified web browser device is outselling a MacBook these. Nothing Apple makes is meeting expectations for sales, and while the whole industry might be suffering a little, Apple is supposed to be the disrupter engaging customers with products they really want, not being passed over and letting a competitor gain market share for fringe devices like the Chromebook. Ahrendts, this stuff is cool and all, love the tree concept ( ? ) but please make sure I can purchase your products in your stores. No Apple Watch situation please please please. Not enough hipsters lived there in the past, but now the place is infested with them.